Imagine sitting on the top of a camel, walking through the Sahara desert like the caravans of yesteryear. 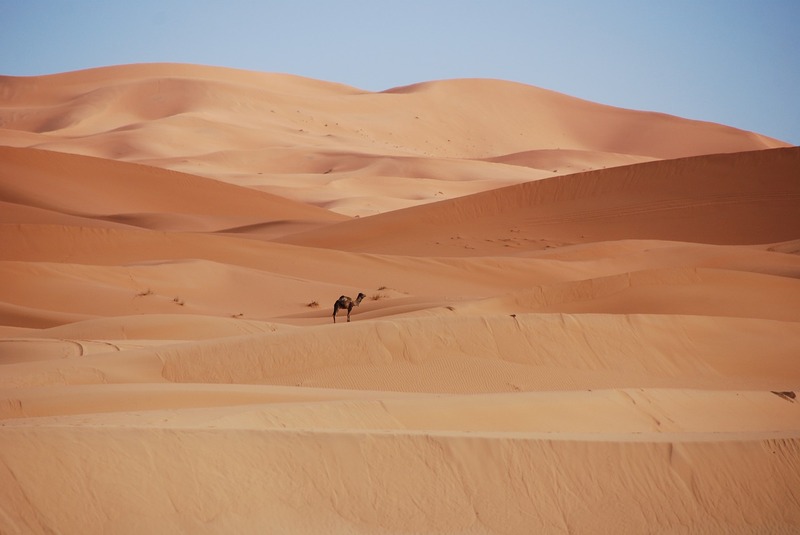 Silence surrounds you, since the only sound is that of the cloven feet of the camels that run along the soft sand. No matter where you look, endless stretches of sand confront you. Far from the stress of modern life, you enjoy the peace and tranquility of loneliness. 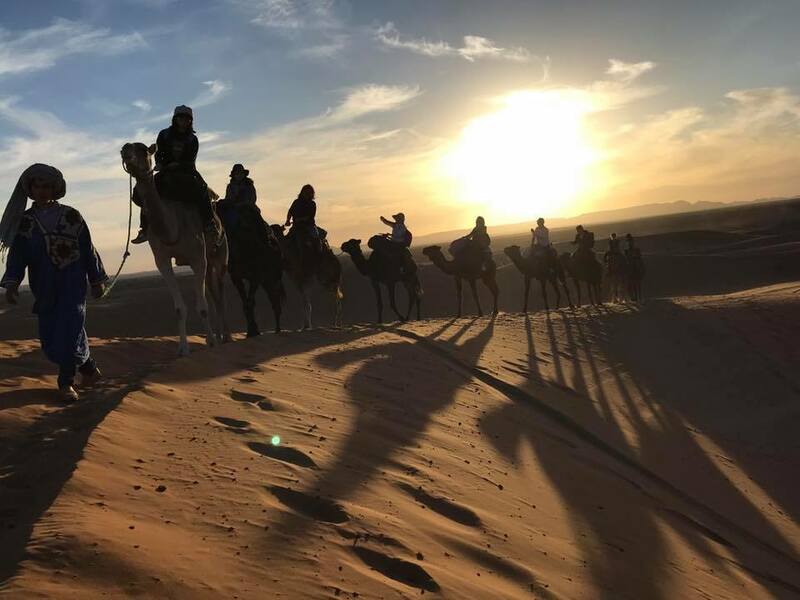 This is about camel trekking in the Sahara desert, and is an excellent introduction to family adventure trips! 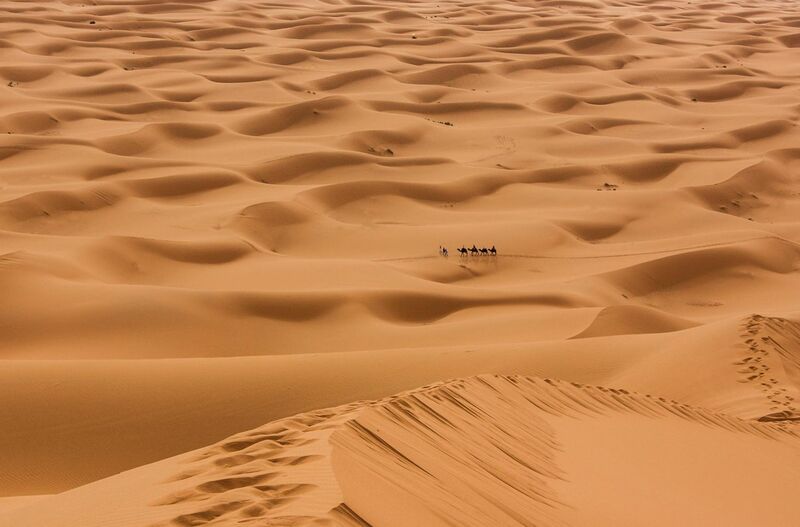 The dunes of Erg Chebbi, near Merzouga, are the highest and most spectacular sand dunes in Morocco. About 50 km southeast of Erfoud, a garrison town and an excellent base for trips through the desert, these golden-red dunes are found where the desert meets the Atlas Mountains. 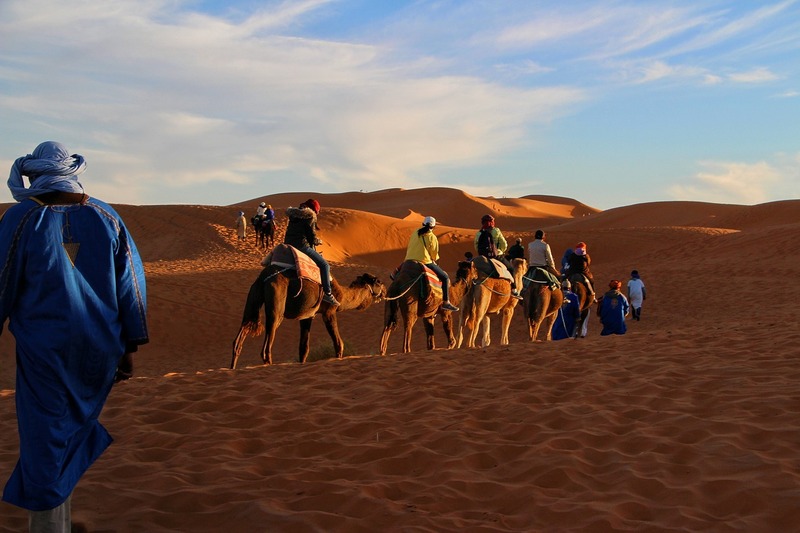 They mark the beginning of a great travel experience, as well as the western boundary of the Moroccan Sahara, which borders Algeria. 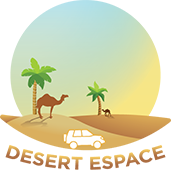 The desert landscape provides the backdrop for this travel adventure that should not be missed. 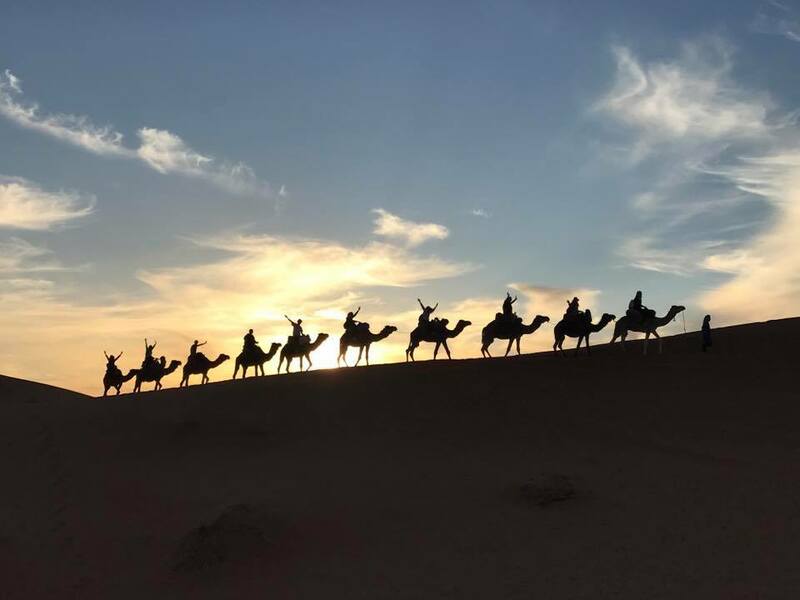 The undiluted peace of the camels that walk along will take you back to the caravans that traveled along these centuries-old routes, in search of a fresh oasis. The bright blue of the sky over the endless red dunes; The infinite views, the solitude and the silence of the desert create mysterious energizing powers. Sometimes, an oasis emerges; On other occasions, simply a mirage. Go through the Berber villages where you can appreciate the simplicity of life: people who draw water from a well, collect pasture and dates or simply tend their crops. The crumbling Kasbahs (fortifications) dot the desert landscape while extraordinary rock formations mark the ground, guiding merchants on their route. With the changing light of the afternoon, the colors of the landscape change from pale brown to golden, then to pink. When the sun sets, the shadows that grow flirt with the amazing colors. After a tiring day, you’re happy to get to the campsite. The Berber tents, with their colorful pillows and bright carpets, offer a haven of relaxation. At night, enjoy a meal cooked under the open skis. When you sit by the campfire, the sometimes native drums resound in the distant distance. Sleeping under the timid black ink, you will marvel at the series of bright stars that line the night sky. In the morning, get up early to see a spectacular sunrise over the dunes before continuing your walk. From the gentle heat of the desert, the nut and the date stop on the road, the Berber villages and the Kasbahs, to the Berber fields, the tribal drums, the bonfire, the races through the sand dunes and the bright stars in the indigo sky The rest of the world seems to be living a life of this oasis of serenity and adventure. 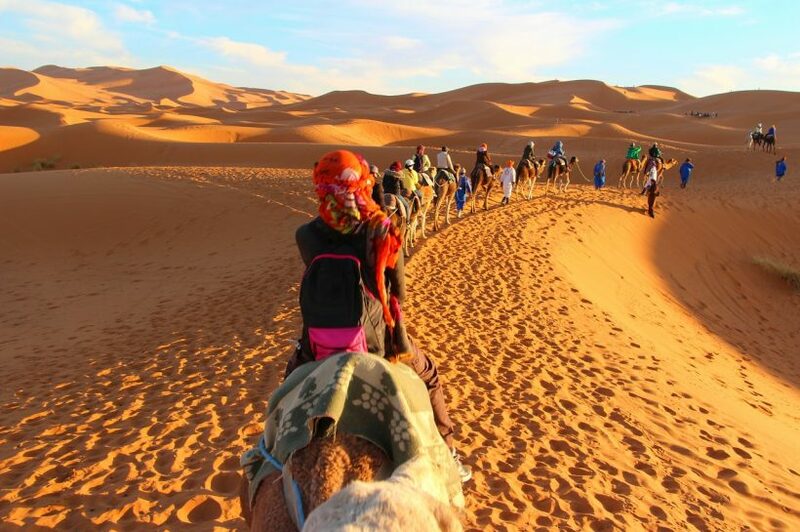 We would love to help you plan the best possible experience in the Sahara. Work with our staff today to help create an itinerary that meets your needs. You can mark all the boxes on your wish list while you know you are in good hands!